As Akira Toriyama gets older, he steps further back from the creation process behind his Dragon Ball franchise. He is happy to let other, younger, artists carry on the legacy of his story with his blessing. One such man is known as Toyotarō. Growing up drawing Dragon Ball characters, Toyotarō became known for drawing one of the Dragon Ball AF Dojinshi (fan made work based on an existing franchise). 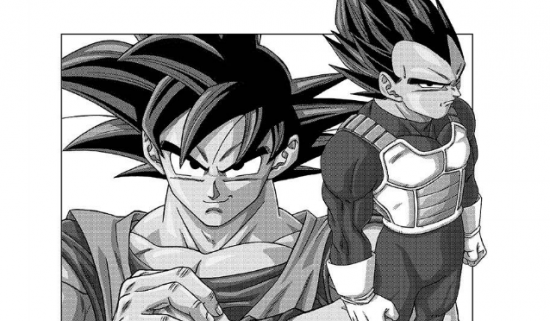 Going from that, into working on the Super Dragon Ball Heroes manga, Toyotarō has move into becoming one of the driving forces and creating minds behind the franchise proper. Responsible for designing many of the newer characters and being behind decisions such as bringing Vegito back during the Goku Black arc. A cover from Toyotarō’s Fan manga under his old pen name: Toyble. Toriyama has highly praised Toyotarō’s interpretation of his story outline as drawn in his manga. While the anime makes deviations he is less happy with, Toyotarō’s personal additions to the manga version of events only improve his story. For the most part, I agree with him. The manga follows the same story beats as Dragon Ball Super’s anime does. However, the manga has a shorter and snappier style of storytelling. While the anime can feel meandering and nonsensical at times, the manga always felt more focused and better thought out. A benefit of it all coming from a single mind, rather than a collection of directors and animation teams. The Goku Black arc is the perfect example of events told better. While I spend a lot of time complaining about how Trunks was treated in the anime, giving him new abilities and levels of strength that made no sense outside of the show’s inability to use him without him fighting. The manga tells the story in a much clearer and logical way. Trunks still gets his hero moment at the end, but his contributions make more sense, and any new abilities he has on display are explained. The Tournament of Power feels like the first aspect of the story that the manga struggles to capture as expertly as it does the rest of the story. The fault doesn’t fall to Toyotarō though, rather the format of the tournament just doesn’t feel like it gels with the medium itself. The entire point of the Universe Survival story arc felt like it was meant to capitalise on the style of anime Dragon Ball Super was. Super ran weekly for its entire, multi year run without breaks. Without a manga to base itself on, it needed a single, long running event to base the rest of his 50-odd episodes around. With the inherent chaos surrounding a battle in which there were 80 competitors, events could jump around while whittling the number down until the final, climactic battle. With such a broad array of fighting strengths on display, even the weaker of the characters in the franchise would get their time to shine. In theory anyway. The success of his was mixed at best, while the likes of Master Roshi and Android #17 came over real well. Krillin, Tien and Piccolo still got the shaft, even though they did get episodes dedicated to them. While the anime dedicated a third of its entire run time to this arc, it feels like the manga is trying to tell the same story in a much more condensed fashion, which ends up being to its detriment in a number of ways. 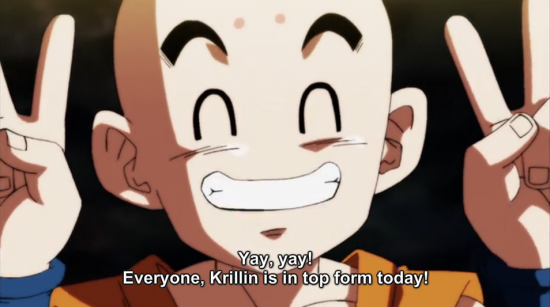 While the likes of Krillin did briefly get their moment to shine in the anime, making a few eliminations, he it eliminated straight away without contributing anything in the manga. Admittedly, the anime did drag a lot of the action out to extents that really weren’t necessary. But it felt like a series of challenges against unknown opponents with all kinds of different abilities that made them challenging without the raw strength. Conversely, the manga does boil everything down to pure strength. While there was indeed a lot of strategy when it came to the battle royale tournament, none of that comes to the surface in the manga. It ends up just feeling like a mass brawl. One in which a good third of the competitors are unceremoniously eliminated right away to leave us with the characters the manga wants to focus on. But even when reducing the amount of characters it wants to focus on, the slightly rushed feeling of the arc means some character development gets left by the wayside also. Two characters that lose out in this aspect are Vegeta and Jiren. I praised the character development of Vegeta as a character when I spoke about Dragon Ball Super after it ended. How he was shown to care for, not just his own family, but the Saiyans of Universe 6 too. How he used them as his driving force toward the end of the tournament. Vegeta seems more chill as a rule in the manga, but hardly reacts or has much of a relationship with Cabba by comparison. Jiren also loses out. The anime does a great job in making him this intimidating, insurmountable presence as soon as he’s introduced. It goes out of its way to show the incredible gap between him and the other competitors on a number of occasions, going even further during his first fight with Goku by having him brush aside Ultra Instinct. In the anime, Goku and Jiren seem to fight at length, in the background during other scenes of focus. With Goku seemingly holding his own. They make him seem powerful, but nowhere near as well as the anime did. When they get to it, I’m sure the manga will handle his backstory and character better as a piece of storytelling. But Jiren just doesn’t feel as impressive as he does throughout the anime. This is the manga though, and while I lament some of the changes made to cater to the format, it still manages to improve on aspects of the anime that I have to get into. Contrary to the title of this post, there are a number of things Toyotarō’s version of events does better. That’s what the manga does though; making better sense of the anime’s nonsense logic and writes it characters a lot more consistently. As I mentioned before, the manga choses to focus its attention on a much more condensed cluster of characters, and those who do get attention benefit greatly from it. For example, look at Hit. 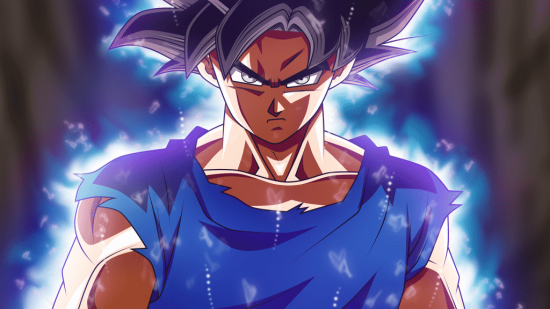 He’s a character with a cool design and set of abilities, but the anime never develops him any further than it does after his first first with Goku. The manga actually gives him a new ability, “Time Lag”, which doesn’t appear in the anime. 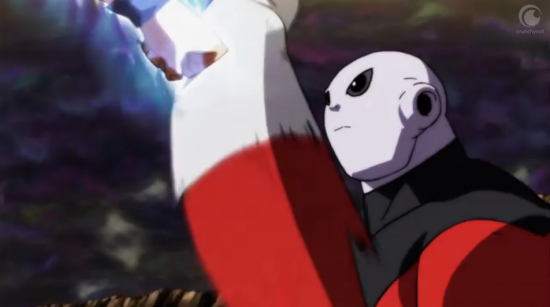 It makes his battle with Jiren in the manga more interesting, rather than the foregone conclusion it felt like in the anime. It also spent significant time, two and a half issues in fact, with the Caulifla/Kale fight, again doing a better job with it. Toyotarō gave a better explanation of Kale’s abilities, rather than just making her a heavy handed collection of Broly references. It makes reference to the original, Legendary Super Saiyan legend mentioned in early Dragon Ball Z. Showing her steadily getting stronger and stronger throughout her rampage until she eventually burns out and self destructs. Toyotarō’s ability to take a brief moment to explain some basic logic is a gift I wish the anime shared. The culmination of which is a fight between the fused Kelfa and Gohan of all people. 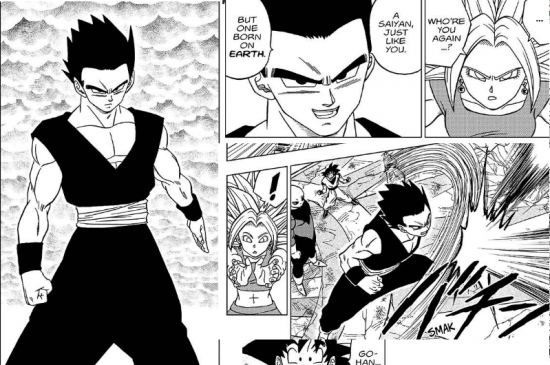 While Gohan in the anime’s tournament of power felt like a half hearted apology, the manga’s treatment of Gohan might be the best version of the character we’ve seen since he beat Cell. Firstly, it actually bothers to take the time to explain Gohan’s “Ultimate” form. Stating that he decided to develop his power as a human, not as a Saiyan. Also, lines from Piccolo and Krillin state that after very little training, Gohan managed to bump his power significantly, and that he could grow further still. While it feels like more of the same when it comes to the character. It’s nice to see Toyotarō making a statement that there is a future for Gohan in the series. The Universe Survival arc of the manga feels like supplementary material to the anime rather than a retelling of it. Admittedly, the anime did have a problem in which a trimming of the fat was badly needed. The manga just seems to cut a little too deeply for my liking. The parts of the story it does chose to focus on, it does amazingly. It’s just, knowing how much they leave out, there are aspects of the story I would have loved to see Toyotarō’s interpretation of. Instead, much of it gets omitted completely. That being said, the manga still is ongoing. As we start to reach the final confrontations, I have to wonder if Toyotarō is going to downplay Vegeta and Android #17 in favour of Freeza for the final confrontation with Jiren. I guess I’ll speak about it again when the manga ends. The thing is, a lot of my complaints here don’t really feel like they’re anyone’s fault. 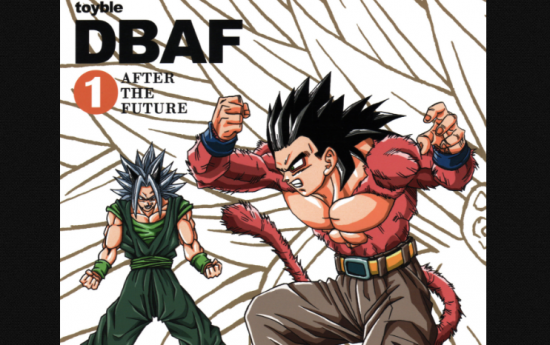 The manga only has so much space to tell its story, and the universe survival arc was such an overblown storyline that things have to be left out of the manga. They just feel like painful cuts as opposed to the necessary ones that we saw in the Goku Black arc. To end on a positive note. Toyotarō seems like a fantastic person to take the torch of this franchise from Toriyama. As we approach the Broly movie and another series following that. The more Toyotarō is involved, the better I think the series will end up faring. All of the respect to Toriyama himself for this making this franchise I love, but the more focused and logical guiding hand of Toyotarō is something Dragon Ball really needs to get back to. Posted on August 31, 2018 by WooderonPosted in Anime, Features and/or Ranting:Tagged akira toriyama, Anime, Broly, dragon ball, dragon ball af, dragon ball super, gohan, goku, jiren, kefla, manga, tournament of power, Toyotarō, ultra instinct, vegeta.